Accra, Nov. 27 GNA- Mr Stanley Nii Agyiri-Blankson, the Accra Metropolitan Chief Executive (AMA) on Saturday joined other AMA personnel, and market women to clear filth at some parts of the business centre of Accra. The exercise, which started about 0810 hours, began at the Derby Avenue traffic light, Makola, was intended to clear refuse created by the traders and hawkers along the street towards the Tudu Traffic light. Before the exercise began, store owners and traders in the area were asked not to open their shops until 1200 hours when the programme would have been over to ensure full participation of the market women. Some traders who were caught doing business while the exercise was going had their goods seized by the AMA Task Force and taken to the AMA head office. 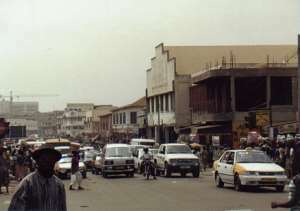 Mr Agyiri Blankson said the programme would continue until the area was rid-off of filth. He urged the traders to sweep the place regularly and keep their surroundings clean. Mr Noel Arcton Tettey, Public Relations Officer of the AMA said the exercise that started some few months ago would be sustained to clear all the refuse and choked gutters in the city. He said the AMA is also going to be tough on traders and hawkers, who litter the streets, adding that, the AMA had to spend large sums of money from its revenue to engage people to clean the streets and collect waste.